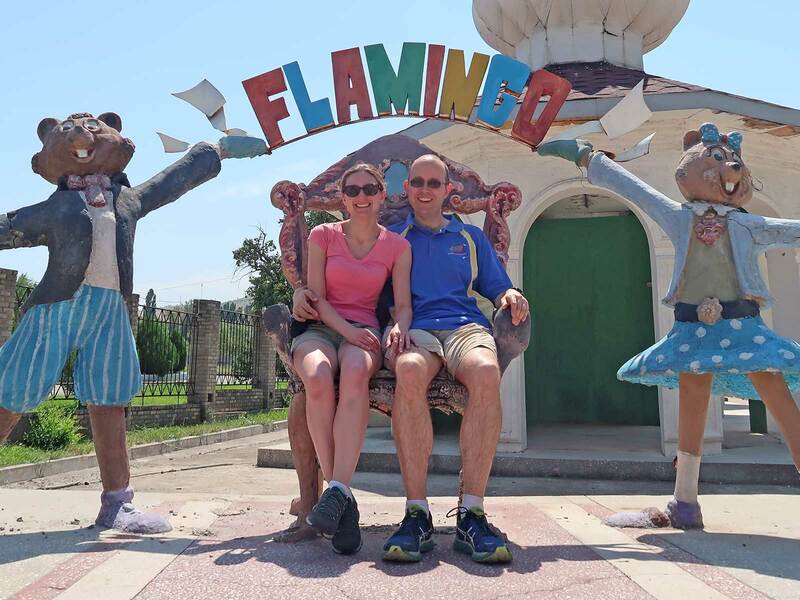 Flamingo World is a family park located a few miles south of the Kyrgyz capital of Bishkek. The entrance plaza has a shaded gate area that may once have held turnstiles, but not now; admission is free, with rides charged individually. An unlimited ride ticket can be purchased if desired; as of this writing it costs 500 som (~€6.29) for those under three years old and 600 som (~€7.55) for older visitors. There is also an upcharge swimming pool with surrounding deckchairs accessible for an additional 350 som (~€4.40). The park is pleasantly landscaped, if a little rough around the edges, presumably due to a limited maintenance budget. A pedestrian bridge just inside the main entrance crosses over an empty concrete trough that was presumably planned as a water feature. On the right hand side of that stands a three storey castle building with a faded Spiderman model climbing its facade. On the left, a faux temple gate and a number of colourful life-size sculptures almost manage to deflect attention from the improvised garden irrigation equipment assembled from dismembered plastic bottles. The vast majority of attractions are aimed at younger visitors. There are eight rides in total that are off limits to older visitors, including two unnamed child sized spin rides, a miniature Pirate Ship, a five car Ferris Wheel, and a Carousel. A full size Sartori Kamikaze stands as a token offering for thrill seekers, who are also able to appreciate the Bumper Boats, a Crazy Bus, and the Crazy Worm (#2481), a standard layout Big Apple that traversed its upper level at an energetic pace. A three lap cycle cost just 70 som (~€0.88) per person. One interesting novelty is a walk-in Haunted House, accessed via a descending spiral staircase. At its base is a room with a snake poking its head up out of a well that for whatever reason is lit by a mixture of red, green, and blue LEDs. A second room is much darker, and decorated only by two face masks hanging from strings. The third and final room features a life size mannequin sitting on a bench with a face vaguely reminiscent of western depictions of Jesus Christ. There is no special exit; instead, those seeking to leave make their way back the way they came in. 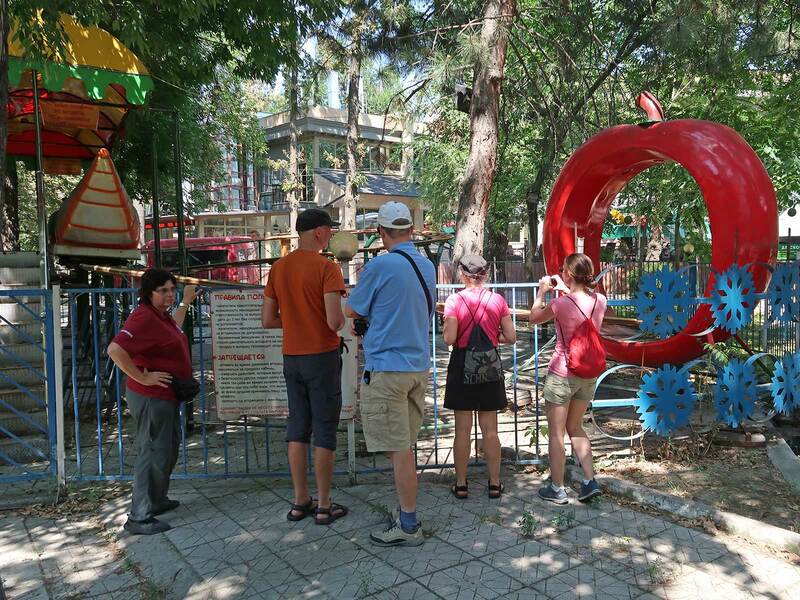 Panfilov Park was a late addition to our trip, discovered during some last minute research just days before travel. We were not able to infer much from satellite imagery thanks to thick trees, but online photo sources suggested the presence of two small powered coasters. These were indeed present, but both were in an advanced state of non-functionality. The quantity of dust on the tracks as well as the overgrown foliage indicated that this was not a temporary situation. Our consolation prize was the Giant Wheel, which gave us the chance to see the skyline of Bishkek from the heights.